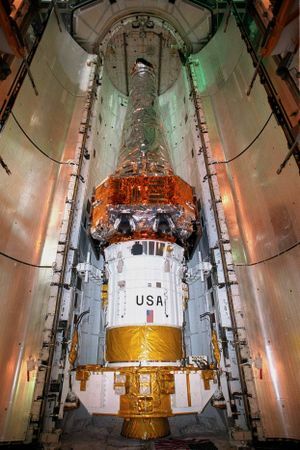 Chandra X-Ray Telescope: Related Pages. Dec 29, 2005 - A team of scientists turned the Chandra X-Ray Observatory back at the Earth, and closely observed the north polar region ten times during 2004. They have discovered low-energy (0.1 - 10 kilo electron volts) X-ray emissions from the Earth's auroral activity. The colour of the X-ray arcs represent the intensity of the X-ray generation, with red indicating the maximum brightness. Dec 16, 2005 - NASA's Chandra X-Ray Observatory has taken a new photograph of SN 1006; a supernova that appeared in the sky in 1006, and blazed more brightly than Venus. We now know that SN 1006 announced the death of a star located approximately 7,000 light years from Earth. It's likely that a white dwarf star was siphoning matter away from a companion star. When its mass exceeded the limit of stability, it exploded. Nov 29, 2005 - This image taken by the Chandra X-Ray Observatory shows the ongoing expansion of supernova SN 1970G, which exploded more than 35 years ago. Astronomers estimate that the shockwaves from the supernova will crash into shells of material shed by the star about 25,000 years ago, completing its transition into a supernova remnant. Nov 15, 2005 - This unique photograph, taken by NASA's Chandra X-Ray Observatory, contains not one, but two supernova remnants. The pair are known as DEM L316, and they're located in the Large Magellanic Cloud galaxy. The gas shell at the upper-left contains considerably much more iron, so it's probably the product of a Type 1a, triggered by the infall of matter from a companion star onto a white dwarf. The lower-right shell is a Type II supernova, the remains of a massive star that exploded a few million years into its short life. Sep 22, 2005 - In 1572, Danish astronomer Tycho Brahe observed and studied an exploding star that would later be named after him. NASA's Chandra X-Ray Observatory shows that the Tycho's Supernova remnant is an expanding bubble of debris which is inside a larger bubble of high-energy electrons. Astronomers think that remnants like this could be a source of cosmic rays; high-energy nuclei found throughout the galaxy which constantly bombard the Earth. Sep 1, 2005 - This newest image released by the Chandra X-Ray Observatory shows the star cluster Trumpler 14. This cluster is located about 9,000 light years away from Earth and contains about 1,600 stars. It has one of the highest concentrations of massive, luminous stars in the Milky Way. The bright stars in the cluster are very young - less than 1 million years old - and will explode within a few million more years as powerful supernovae. Aug 18, 2005 - One of the most famous supernovae in recent memory is SN 1987A, which exploded in the Large Magellanic Cloud. Before its death, the star produced a ferocious stellar wind that carved out a large bubble in the surrounding, colder gas. When it went supernova, a shockwave traveled out in space, and astronomers have been waiting in anticipation for the shockwave to slam into the edge of this bubble. New images from NASA's Chandra X-Ray Observatory shows that this stage now appears to be underway. Jul 20, 2005 - Observations with the Chandra X-Ray Observatory have given astronomers some clues about what causes millisecond pulsars - extremely dense stars which can spin many times a second. Several of these pulsars were discovered in a stellar cluster called 47 Tucanae, where the stars are less than.1 light years apart. Astronomers think these pulsars started as regular neutron stars, but tightly joined with stellar companions they picked up in the cluster. Eventually they get so close they start drawing material off the companion, which causes them to speed up. May 31, 2005 - New observations from the Chandra X-Ray Observatory have discovered two white dwarf stars orbiting one another at a tremendous speed - they're only 80.000 km (50,000 miles) apart! The rate at which they're orbiting is decreasing by 1.2 milliseconds every year, which means they're destined to eventually collide. What's important about this find is that the stars are probably creating gravity waves, as predicted by Einstein, and these gravity waves should increase as they get closer and closer. Apr 28, 2005 - Astronomers have theorized that Mira AB is a binary star system consisting of an evolved red giant star and a white dwarf star, and now the Chandra X-Ray Observatory has been able to resolve their relationship. Chandra can actually resolve the stream of matter flowing off the red giant, which is then captured by the white dwarf. This matter heats up as it bunches up around the white dwarf, and blazes in the X-ray spectrum. Mira AB is only 450 light-years away, and the stars are separated by approximately twice the distance of the Sun and Pluto. Apr 19, 2005 - The Chandra X-Ray Observatory spent 150 hours examining supernova remnant G21.5-0.9, revealing a beautiful ghostly shell. The shell is created by the shockwave of particles ejected by the supernova explosion as they slam into material that was sloughed off earlier by the star. This shockwave heats the surrounding material to millions of degrees causing it to blaze in the X-ray spectrum visible to Chandra. The star that produced this explosion was probably 10 times larger than the Sun. Feb 2, 2005 - NASA's Chandra X-Ray Observatory has located two huge clouds of interstellar hot gas that could partially explain where all the matter is in the universe (we're not talking about Dark Matter here, just regular matter that hasn't been seen yet). Computer simulations predicted that this missing matter could form into a weblike structure of gas clouds, from within which clusters of galaxies formed. These clouds have defied detection until now because of their low density. Astronomers used Chandra to watch a distant galaxy which has been brightening for about 2 years. Their data showed that two separate clouds of gas containing ions of carbon, nitrogen, oxygen, and neon were absorbing X-rays from this galaxy. Jan 6, 2005 - Astronomers have used the Chandra X-Ray Observatory to watch the most powerful eruption ever seen in the Universe. The eruption is coming from the heart of a distant galaxy cluster called MS 0735.6+7421; it's been going on for more than 100 million years, and generated the equivalent energy of hundreds of millions of gamma-ray bursts. Astronomers believe that this energy is being released because a supermassive black hole has sucked in more matter than it can consume - the mass of 300 million Suns is being swallowed - and this excess is generating tremendous heat as it backs up. Jan 4, 2005 - The Chandra X-Ray observatory took this image of an unusual star called Beta Ceti. It's only three times more massive than our own Sun, but it radiates 2,000 times more X-ray power. Astronomers believe it's putting out so much X-ray radiation because it's at an advanced stage of stellar evolution called "core helium burning". For its first billion years, Beta Ceti was converting hydrogen to helium through fusion, but it ran out of hydrogen fuel and became a red giant star. Then it started to shrink again, and temperatures rose to 100 million degrees; hot enough that it could begin fusing helium atoms together to create carbon atoms. Dec 14, 2004 - The Chandra X-Ray Observatory took a good long look at a pulsar and found that it's cooling rapidly, and suggests that it has matter packed much more densely than scientists were expecting. An international team of astronomers used Chandra to measure the pulsar at the centre of nebula 3C58, which is the remnant from a supernova that exploded in 1181. In less than 800 years, it has cooled to less than 1 million degrees Celsius - for pulsars, that's cold. The cooling depends on the density of the matter in the pulsar. Nov 10, 2004 - NASA's Chandra X-Ray Observatory took this image of red dwarf star Proxima Centauri, our closest stellar neighbour (after the Sun, of course). The image shows that its surface is in a constant state of turmoil, with flares occurring almost continuously. Proxima Centauri has only 1/10th the mass of our own Sun, and the conversion of hydrogen to helium happens much more slowly. This creates turbulent, convective motion throughout its interior, which stores up magnetic energy - the energy is what creates all the flares. Oct 26, 2004 - Astronomers using the Chandra X-Ray Observatory have discovered a huge halo of dark matter around an isolated elliptical galaxy; an object that shouldn't have such a halo, according to optical observations. The galaxy, NGC 4555, is unusual that it's a large elliptical galaxy which isn't part of a larger cluster of galaxies. It's surrounded by a cloud of gas, twice the size of the galaxy itself, that's been heated to 10-million-degrees Celsius. This gas could only get that hot if it was being constrained by a halo of dark matter ten times the mass of the stars in the galaxy. Sep 23, 2004 - The Chandra X-Ray Observatory took this image of a pulsar surrounded by high-energy particles as it plows through interstellar space. The pulsar is hurtling to the left in this image at a speed of 2.1 million kph (1.3 million mph), and the particles are being blasted back like the tail on a comet. The pulsar is known as "The Mouse", aka G359.23-0.82, and it was discovered in 1987 by radio astronomers using the Very Large Array in New Mexico. Because it's moving so quickly and interacting so visibly with its environment, astronomers have a unique opportunity to understand pulsar magnetic fields, and how they eject material. Aug 23, 2004 - This is a detailed image of an exploded star called Cassiopeia A, taken by the Chandra X-Ray Observatory. The space-based observatory focused on this remnant for 1 million seconds (just over 11 days), and revealed the bright outer green ring 10 light years across which was generated by the shockwave from the supernova explosion. Two large jets extend outside this shockwave on opposite sides, and contain large quantities of silicon. This means they were formed early on in the explosion; otherwise, they'd contain mostly iron from the star's central regions. Aug 16, 2004 - A new image of Abell 2125, taken by the Chandra X-Ray Observatory, shows several intergalactic clouds of hot gas in the process of merging together; they seem to be in the process of creating a single massive galaxy cluster. Chandra's resolution allows astronomers to distinguish the clouds from the individual galaxies inside it. Click here to visit the main page on, Chandra X-Ray.